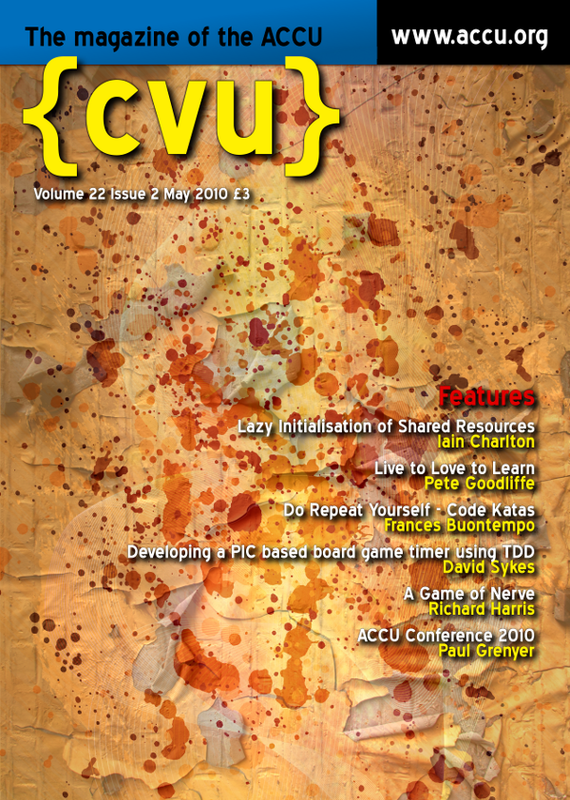 Issue 22.2 of ACCU's CVu magazine is rolling off the printers now. It contains the third (and final) part of my mini-series on software developers learning: Live to Love to Learn. This installment is the 61st Professionalism in Programming column I have written. Phew! I've also contributed to Paul Grenyer's Desert Island Books column, describing five techie books and two CDs that I'd take with me to my very personal desert island prison. It was an interesting and challenging choice to make. Paul wrote some very kind words about me, too. Paul, I'm blushing! This issue also contains a book review I wrote (of iPhone Advanced Projects by aPress), as well as a photo of me speaking at ACCU 2010. I'm going for maximum exposure, clearly. When I sent this month's cover image to Steve Love, the editor, he said it looked like I'd spilt coffee all over it. It's another great issue (despite all my contributions). If you're not an ACCU member but you're passionate about programming do consider joining ACCU now.